Moreover, they are rich in antioxidants, that provide powerful anti-inflammatory properties. According to Rachael Link, MS, RD, they are high in nutrients, but low in calories. Yet, if it sounds too good to be true, you are probably right, as these healthy and tasty berries are unfortunately very expensive. However, we offer you a way to reap all the benefits of these berries and skip the price tag- grow them on your own! 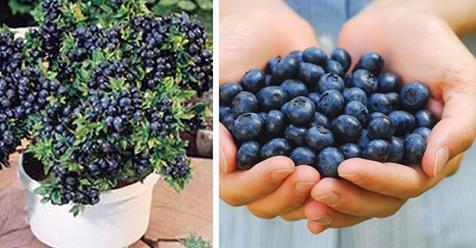 Ask around in order to find the right kind of blueberry bush that will suit the climate where you live the best. Find a high-quality soil with a pH of between 4 and 5. You need to find an area that gets a lot of sunlight during the day, as blueberries need lots of it. Leave 5 feet between each bush. Also, the bush will need 1 to 2 inches of water weekly. Protect your blueberries from birds and insects, by placing a frame of bamboo sticks around the plant and covering it with a food-grade net. Blueberry bushes can produce fruit for up to 20 years, so make sure you prune them every few years. The prunes bush will not produce berries that ear, so in order to ensure a continuous supply of berries, plant more bushes and alternate pruning years. The blueberry buds usually start popping out in the early spring, but the right time to pick the berries in July. Yet, wait for a few days after they turn that beautiful shade of blue, and they will be perfectly ripe, and even start falling off the bush into your hands. Therefore, you can now enjoy the fantastic taste and numerous benefits of blueberries without paying too much money. Start growing them on your own, and look out for some new delicious blueberries recipes!